К участию приглашаются художники старше 18 лет, основным профилем которых являются графика и живопись. Победителям будут вручены награды в трех номинациях. Приз в каждой составит £1,000 + материалы для творчества от мировых брендов (на сумму £3,000). Награждение победителей пройдет 22 июля на частном показе в Griffin Gallery! - Награда “The Winsor & Newton painting prize” вручается за работы, выполненные маслом, акварелью, гуашью или чернилами. - “The Liquitex acrylic painting prize” - за работы, выполненные акрилом. - “Conté à Paris drawing prize” - за графику. Работы будут оцениваться по уровню иновационности, мастерства и практики. На каждую номинацию можно подавать до трех работ, созданных после 2010 года. Регистрационный взнос £10 (за одну работу). Шорт-лист составят порядка 120 работ (выбираются в цифровом виде). В июле 2015 участникам необходимо будет доставить работы в галерею для окончательной оценки жюри. Июль 22. Частный показ и награждение победителей! директор Griffin Gallery Becca Pelly-Fry. Griffin Gallery расположена в Западном Лондоне. Независимая галерея поддерживает художников, поощряет новые таланты, определяет лучшее в современном искусстве как Лондона, так и мира. Помимо выставочной программы, галерея проводит множество мероприятий для художников и професссоналов искусства, включая дискуссии экспертов и вручение собственной премии. Prizes to be awarded at the Griffin Gallery Open Private View on July 22. · Winsor & Newton painting prize- £1,000 and £3,000 in art materials. · Liquitex acrylic painting prize- £1,000 and £3,000 in art materials. · Conté à Paris drawing prize- £1,000 and £3,000 in art materials. 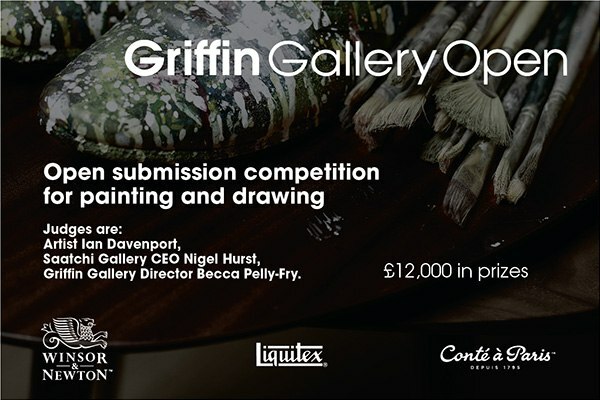 The Griffin Gallery Open exhibitors and prize winners will be selected by artist Ian Davenport, Saatchi Gallery CEO Nigel Hurst, and Griffin Gallery Director Becca Pelly-Fry. The judges will be looking for innovation, skill and commitment to practice in painting and drawing. Artists can submit up to 3 works made since 2010 for each of the major prizes. The Winsor & Newton painting prize is for works based in oil, watercolour, gouache or inks. The Liquitex acrylic painting prize is for works based in acrylic and the Conté à Paris drawing prize is for works in dry media. The winner of each prize will receive £1,000 cash plus £3,000 RRP value in art materials of choice. Cost for entry is £10 per work. The first round of judging will be from digital submission then approximately 120 works will be invited in to Griffin Gallery for the judges to make their final selection. Ian Davenport was born in Kent in 1966 is one of Britain’s leading abstract painters and printmakers. He graduated from Goldsmiths College of Art, London, in 1988 and as one of the generation of Young British Artists, he participated in the seminal 1988 exhibition Freeze. In 1991 he was shortlisted for the Turner Prize and since then has exhibited internationally and undertaken numerous large scale site-specific paintings, including the 50m long mural, Poured Lines: Southwark Street, under the Western Bridge on Southwark Street, London. Davenport's work is held in numerous public collections, including the Arts Council Collection, London, Dallas Museum of Art, Texas, Tate Gallery, London, Southampton City Art Gallery, Southampton, Weltkunst Collection, Zurich, and the Centre for Modern and Contemporary Art, La Spezia, Italy. Nigel Hurst is Chief Executive of the Saatchi Gallery in London. He graduated from Goldsmith’s College, London University in 1986 and since then has curated numerous international exhibitions. He joined the Gallery as a curator in 1995, working on Sensation at the Royal Academy of Arts, London, the National Galerie at the Hamburger Bahnhof, Berlin and the Brooklyn Museum of Art in New York. More recent exhibitions have focused on Asian contemporary art including The Revolution Continues: New Art from China (2008), Unveiled: New Art from the Middle East (2009), The Empire Strikes Back: Indian Art Today (2010), The Silk Road in collaboration with the City of Lille, France (2011), Korean Eye (2012) and Hong Kong Eye (2013). Recent touring exhibitions also include USA Today and Newspeak: British Art Now at the State Hermitage Museum in St. Petersburg (2008 and 2010) and Saatchi Gallery in Adelaide: British Art Now at the Art Gallery of South Australia (2011) and Hong Kong Eye 2013. Becca Pelly-Fry is Director of Griffin Gallery and Global Programme Manager for The Fine Art Collective for Colart International. After graduating with a BA in Fine Art from Northumbria University in 2002, Becca then spent the next 6 years in Newcastle, working as Gallery Manager for a new commercial art gallery before moving into public sector arts management and running festivals, events and art projects in Durham. During this time Becca was also practising as an artist, and putting on group exhibitions in unusual spaces with her art group, Hatch Arts. Becca moved to London in 2009, for a position as Arts Development Officer for the Royal Borough of Kensington & Chelsea which kept her busy for 3 years and introduced her to a wide range of arts professionals and creative people working in the city. A short spell in Camden Council’s Arts and Tourism Department for the Olympic year brought further excitement and new challenges, until being invited to apply for the new post of Griffin Gallery Director and Global Programme Manager for ColArt International Holdings, based in Shepherds Bush. The Griffin Gallery is a recent gallery in West London supporting artists and encouraging new talent, hosting discussions and celebrating the best in contemporary art in London and around the world. A particular focus for Griffin Gallery is the championing of craftsmanship across all contemporary art disciplines. Situated underneath the headquarters of world-leading fine art materials brands Winsor & Newton, Liquitex and Conté à Paris, the Gallery is home to an extensive series of events for artists and arts professionals, including expert talks discussing techniques and advice, running alongside the main exhibition programme. The Griffin Art Prize artists’ exhibition and residency award has been running since 2012. The Studio Building houses not only the Griffin Gallery, but also an Innovation and Development Laboratory and two purpose-built artists’ studios. The Gallery occasionally hosts workshops in the development studio where invited artists can use art materials, created by resident chemists. This bridges science and art with the latest art materials and colours made using the best raw materials, going on to be sold worldwide. This independent gallery is under the Directorship of Becca Pelly-Fry.